We have been in Zambezi for twelve days, with only seven remaining. With the passing of this week, we have gotten to the point where we have less time remaining than we have already spent here. Some of our projects have been completed, and many of them are starting to come to a close. With the little time we have left in Zambezi, I find myself wrestling with the idea of whether these people need us to solve problems in their community, or if we are doing them the most service just by showing up. This community, region, and country as a whole have problems that are much too large for any Westerners to swoop in and solve, especially a small group of students and professors from Spokane. I have spoken to a number of local people who have expressed some of the greatest problems they see in Zambia. Some of these problems include: Lack of government funding for sanitation programs and infrastructure, an inadequate education system, and the unavailability of capital investment for local entrepreneurs. Each of these problems has its own unique challenges at both the small and large scale. Samson from Seeds of Hope, the Zambian NGO the engineering team worked with on their water filter project, explained to us that the Zambian government allocates a grossly disproportionate amount of funds to healthcare as opposed to sanitation. Many of the health problems in Zambia are the result of waterborne illness, so instead of stopping the problem at its source, government programs are essentially allowing people to get sick and then treating them for their preventable diseases. While it is necessary to help people who are currently sick, allowing the cycle of preventable disease to continue is not a sustainable model for the future. Education is another key problem in Zambia. Some of the students who attend our engineering classes at the convent are recent graduates of secondary school, and are looking towards higher education. I have spoken with several of them, and the consensus is resoundingly the same. Zambia’s universities do not have the capacity or resources to educate all of the qualified students who desire a degree. There is a huge surplus of intelligent, hard-working people who do not have the formal qualifications to attain gainful employment. While people in developed nations like the US have opportunities for entrepreneurship and private enterprise, Zambians lack the socioeconomic structure to support innovators who lack formal education. At the large scale, Zambia’s booming copper industry is predominately owned and operated by Chinese companies. Many of the country’s economic problems could be significantly mitigated if there were a way for Zambians to run their own mining operations, providing jobs to thousands and bolstering the economy as a whole. At the small scale, there is not a reliable banking system to provide small business loans or even microloans to people who have good ideas, but cannot come up with capital on their own. Alube, a friend of the program Jeff and the engineering team recently visited, is a highly skilled electrician, but is unemployed and lacks the money to start his own home wiring company. At every level of the Zambian economy, there just isn’t enough money to go around. The problems I have identified seem very overwhelming, especially in light of all the privileges we take for granted in the US. Although I felt like I knew what I was getting into when I came to Zambia, I can’t escape feeling a sense of desperation for these people in this great nation, especially after hearing their personal stories and sometimes cries for help. I realize what we are doing here makes a small impact in light of the vast problems facing the country as a whole, but what I have come to realize and accept is that we are not capable of or responsible for solving these problems. Yes, we come here with the intention of service and improving the community, but it isn’t our job to figure out how to turn Zambia into a prosperous nation. That’s a job for the Zambian people. We are merely here to walk with them to understand their suffering, and offer them a few tools to improve their own situation as they see fit. Throughout most of this trip, I’ve been struggling to decide if what we are doing here is the most efficient or productive way to improve the situation for the people here in Zambezi (can you tell I’m an engineer?). Over the last few days, I realized I’ve been asking the wrong question. The question should be “are we helping this community?” and the answer is undoubtedly “yes.” As Mother Teresa famously said, “Never worry about numbers. Help one person at a time and always start with the person nearest you.” Although I’ve dedicated the last four years of my life and probably my entire career to worrying about numbers, I find solace in the notion of knowing that we are doing positive work here, even if it is only making a small impact in the grand scheme of Zambia’s struggles. After dragging you all through the mud by discussing everything that’s wrong with Zambia and how we can’t fix it, I would like to end this post by painting a picture of what this program has done for the community of Zambezi and how the local people feel about it. This morning, the Gonzaga team met at the front of the education director’s office. With over a hundred school children and adults from the community, we marched to Chilena basic school for the grand opening of the library, which was funded through Gonzaga’s Zambia Gold program and is one of the largest in the entire province. After three miles of singing, dancing, chanting, and running, we arrived at Chilena to see a crowd of hundreds more awaiting our arrival. Dignitaries from various government departments were seated in plush chairs underneath shade tents. 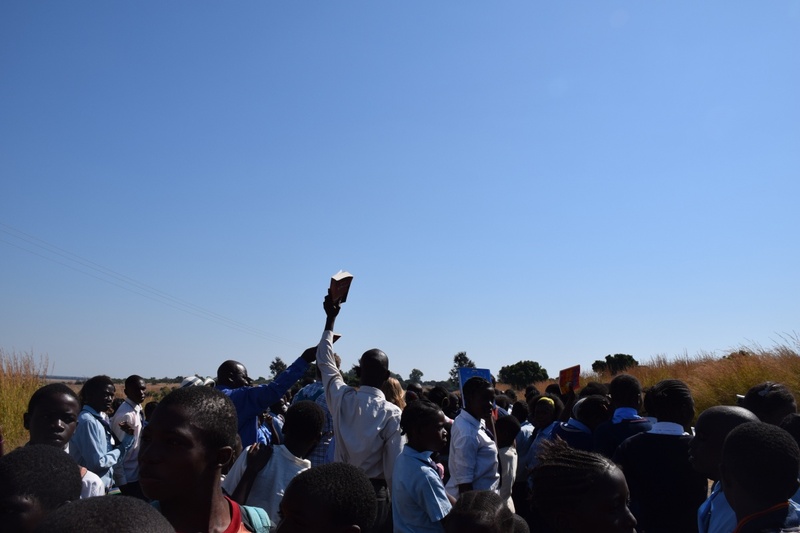 Children stood in the sun for hours while choirs sang, costumed boys and girls danced traditional dances, and people in freshly pressed suits gave heartwarming speeches. After resounding sentiments of gratitude to Gonzaga from the entire community, we were gifted an assortment of local fruits and a goat, which I have come to understand is one of the highest forms of respect in Zambia. After the ribbon was officially cut, we were allowed to tour the library. What stood out to me was not the vast assortment of books and learning materials, but the children peering through every window, eagerly awaiting to dive into the new wealth of knowledge in their community and to educate themselves for a brighter future. I completely understand you coming to terms with not being able to “fix it.” That’s a hard realization to make. It’s not in a “giving up” way but in a “this is bigger than me” thing. I know you are a world away from home but some of your experiences sound very familiar to my own experiences working in an inner city school in the US. It’ll be really interesting to compare notes when you get home. Just know that what you are doing might not “fix the problem” but you are making an impact on everyone you work with. Love on those babies for me and teach as much as you can to their parents. Parent education is key! Have fun and enjoy your last few days!! Excellent posts each of you the last several days. (I am behind, sorry) Collin this was beautiful, and real. Shelby, I knew it was you writing and smiled! What wonderful things each of you are doing. I can’t wait to hear more from sweet Katie! Hope you are all well. Peace! I think it must be difficult being a numbers guy and Engineering student to be overwhelmed by what you cannot do in terms of solving all the issues that you mention. But apparently you figured out what a difference you and the team are making. Your last paragraph summed it up on the opening of the library. How amazing was that? Great description. It must be difficult being a numbers guy and an engineering student to know you can’t begin to solve all the issues you list. I think several of you have indicated frustration in making a difference in this community. Great quote about one person at a time and I think your last paragraph was powerful proof of Gonzaga past and present students /Zambien gold making a huge difference. Excellent description of the opening of the library. Such an insightful reflection. I learned so much just from reading what you wrote and will spend the rest of the night tossing and turning in bed reflecting on it myself (so thanks for that). I am so blessed to have spent time in Zambezi and am so happy and excited that you all have too. It was three years ago that I was there and I still see those crazy little kids everyday in my students here in Federal Way. In fact, I just learned that my neighbor in my apartment complex is from Malawi which borders Zambia. I spent time the other day chatting with him and a friend of his who is from Zambia. He mentioned that he makes Nshima at least three times a week, so if you guys are having Nshima withdrawals when you get back just hit me up. Cherish these last few days with the beautiful people of Zambezi. And I agree Collin, the best gift you can give is one of companionship so enjoy every moment walking alongside those dirt roads with those incredible people! Beyond proud of you, man. As a practicing professional Civil Engineer I know you have chosen a profession that will allow you to help people throughout your lifetime if you so choose. May God continue and to bless you and keep you safe throughout your remaining stay. and my first thought was, you are taking engineers on this trip?!?! How could you?! Great post Collin. Keep helpin’ one person at a time. P.S. @Josh – Lucas, Liz, and I are all going to be together this evening in Seattle. 6 years later we are still getting together and talking about our time in Zambezi. I enjoyed reading your thought provoking post. Living in America we seem to think every difficulty or in justice can be remedied most of the time with little effort or even thought to the ramifications short and long term. We seem to think money and more money is usually the solution. We fail to acknowledge what you have encountered, governments, cultures may stand in the way. Your title “Small Steps, Hand in Hand is exactly what our faith calls us to do! I am glad you have the ability to experience the wonderful people and culture of Africa. I look forward to your return to hear all your stories, they will be memories to last a lifetime. Continue to enjoy the sights, sounds and people you meet! Please send back pictures of a baby zebra, a baby giraffe, a baby cheetah, a baby elephant, and a baby lion. If you ever go to Africa again please tell me so I can pack and come to Africa with you! I am impressed by your insight as to as much as we desire to assist and improve lives around the world by and large it is by reaching out, assisting one person at a time as our Catholic faith calls us to do. Unfortunately, we have seen in numerous cases here in America the more money that is earmarked to fix a problem only exasperated or enables the problem to multiply. In other instances the government focus as you mentioned is misguided in regards to the direct needs of people, such as clean water. We sure do take for granted the luxury of turning on a tap here at home! We all look forward to your return, hearing your stories about the sights and wonderful people you have met along your journey in Africa. I hope you send pictures of a baby zebra, baby giraffe, baby elephant, baby lion and a baby cheetah. Next time you go to Africa, I will pack and go too.